to your door on September 1st! Now is the time to insure you'll get Komplete 8 as soon as we do! Prices start at $199 for the Komplete 8 Update, $369 for the Komplete 8 Crossgrade, and $499 for the full version. Komplete 8, plus 23 additional instruments and effects including Kontakt, Guitar Rig, and Reaktor. Prices start at $499 for the Komplete 8 Ultimate Upgrade and $999 for Komplete 8 Ultimate. As an added bonus, all versions include a gift certificate, exclusively with audioMIDI.com! presets are now optimized for browsing in Maschine. Komplete 8 Ultimate is the all-inclusive premium bundle for music production, live performance, and sound design. Own the last word in NI excellence – 50 products from flagships such as Kontakt 5, Guitar Rig Pro 5, and Reaktor 5.6, to brand new stars like Session Strings Pro, Studio Drummer, the high-grade studio effects of Solid Mix Series and Vintage Compressors– each boasting intuitive user interfaces and fast and efficient workflows. Komplete 8 Ultimate includes literally every Komplete Instrument and Effect currently available– 50 products in total. It’s so big it comes on a sturdy, dedicated USB 2.0 drive. Install everything in one sitting, by simply copying over Komplete 8 Ultimate to your chosen drive. Premium collection of Komplete Effects, including the Solid Mix Series, Vintage Compressors, and The Mouth. Ready for Pro Tools®, Logic®, Cubase®, & Live™. Thermionic Culture is a company well known for making unique products that oozes tons of character and attitude. Their newest product "The Nightingale" is no exception. 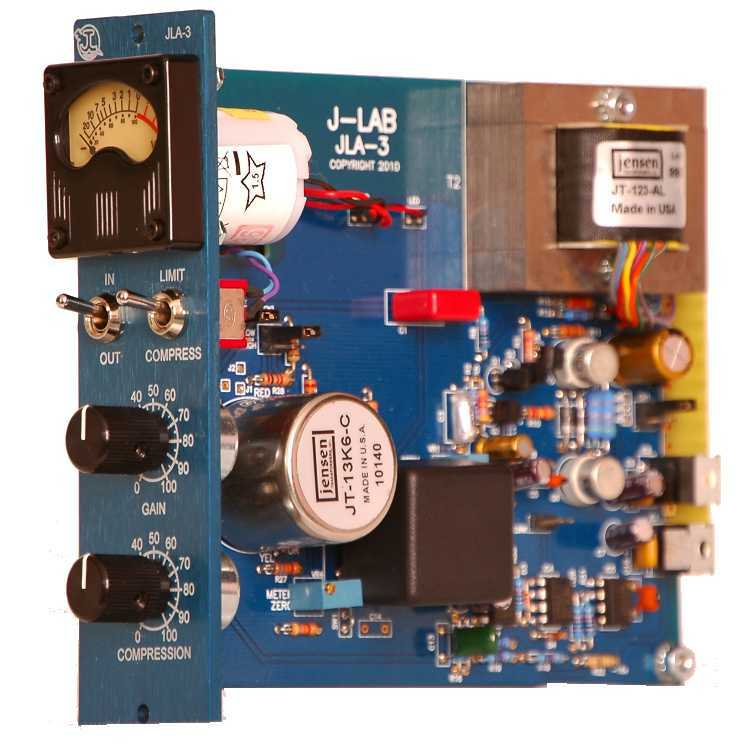 It's a 4 RU unit consisting of a two-channel microphone/line preamp combined with a single channel compressor, D.I. inputs, Phase switches and 2 band equalizer with HPF and LPF filters. Take a look at the pic above and you will see that Thermionic Culture has packed a lot of features into this unit. I like the fact that the compressor can be fed from either mic pre or both which makes it a great choice for recording stereo sources and also as a buss compressor while mixing. 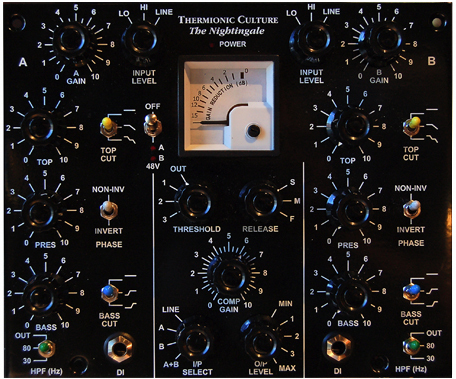 "The Nightingale has 2 x Mic amps with useful valve eq. Both have their own outputs (XLR unbalanced), which can give 20+dBu. These can be combined or taken individually into 1 x vari-mu compressor-based on The Phoenix but with a little more "attitude". The compressor section has its own input ("balanced" XLR) which can be selected instead of a feed from the mic amps, also an XLR "balanced" output capable of +25 dBu. Apart from the obvious 3 separate parts of 2 hi quality mic amps with eq + superb compressor additional uses are As 2 mic inputs into the compressor for live or studio vocals. Using the Phase switch on 1 channel, combine 2 snare drum mics thru the compressor for really fat results. 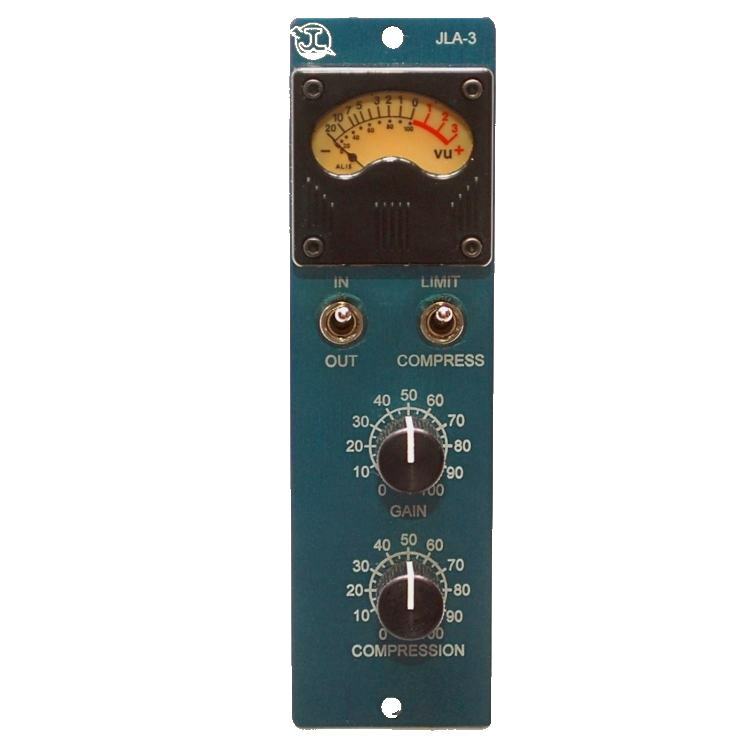 You can take individual outputs and do parallel compression easily by feeding a signal thru 1 mic amp straight to mixing desk/DAW/tape then select the same mic amp output to the compressor, drive it and feed the compressor output to another channel on the mixing desk/DAW/tape & combine them..."
"The JLA-3 is a 500-series compressor/limiter designed for use in demanding professional audio applications such as recording, broadcast and touring sound systems. It has the compression characteristics of widely accepted vintage optical compressors using a long-life interchangeable JT-5 optical gain reduction block for high performance, low power consumption and low heat generation. "Fast" and "Aggressive" models of plug-in optical blocks are available to custom-tailor the compression curve and timing for a wide variety of applications."